The 10th annual International Orthodox Exhibition opened in Yekaterinburg on Tuesday. Yekaterinburg Deputy Head Sergei Tushin presided over the opening of this year’s festival, which is held under the theme, “From Repentance to the Resurrection of Russia,” Ekburg.ru reports. The opening ceremony consisted of an introductory blessing and a longer solemn prayer conducted by clergy from Uzbekistan. More than 250 exhibitors from across Russia, Belarus, Israel, Greece, Moldova, Ukraine and Montenegro gathered for this year’s event. Many participants are representatives of large orthodox monasteries and temples, according to Ekburg.ru. Festival attendees are free to browse and purchase Russian Orthodox literature, handicrafts and church vestments, as well as locally produced clothing and food products, including honey, jams, sweets and vegetable oils, Ekburg.ru reports. The 2014 International Orthodox Exhibition fell on the 700th anniversary of the birth of St. Sergius of Radonezh, who is considered to be the first icon of Moscow’s Holy Trinity St. Sergius Lavra monastery. The St. Sergius monastery honored their icon’s birth at their booth this year with special relics pertaining to him, including a royal cross that once belonged to the Romanov family, according to Ekburg.ru. 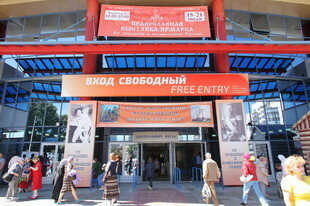 A Russian folk culture festival was also held in conjunction with the exhibition. This festival showcased culturally-significant Russian crafts including weaving, ceramic toys, Russian shirts, lacquer pantings and cut stones. Attendees of the cultural festival are encouraged to wear traditional Russian folk costumes to celebrate how Ural area residents dressed 100 years ago, Ekburg.ru reports.